Ideal for families! The 2-level room is enough for 2 couples or for a 4-member family. The pool is large and very clean. There is even a small playground in the facilities i8 i8. The surrounding area is beautiful, very well maintained. The hotel staff was very kind and helpful. 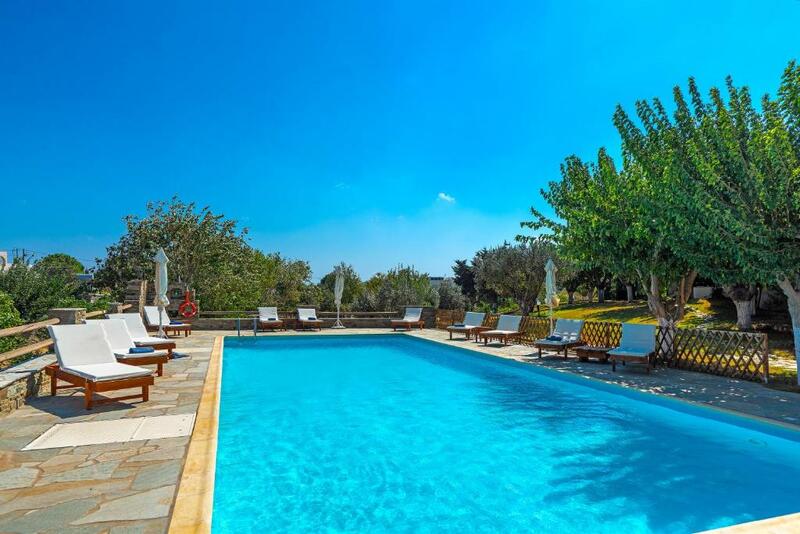 The personel was very kind and helpfull - , we stayed in Villa Sofia with two children, they enjoyed swimming in the pool (there are two - a small one and a bigger one), this is a very peacefull and intimate place - during the day we shared the pool only with one familly. The garden was very beautifully kept and we could taste grapes and figs picked from the trees. staff could not have been nicer or more helpful. wonderful people. We loved this place! The house was clean and comfortable, the pool great and the location beautiful and quiet. Very friendly staff. Very clean room and the personnel was very polite and helpful. Very convenient that there is a playground for the kids to play. Close to the beach. Bed was firm and very comfortable. Gardens, pool and rooms exceptionally well maintained! Tranquil property and only 10 min walk to beach. Hostess was genuine and professional. HIGHLY recommend. Πολύ ευγενικό προσωπικό, πολύ καθαρό δωμάτιο, ευρύχωρο, με ότι χρειάζεται να έχει και με αρκετά καλό wifi! Στο πρωινό είχε όλα όσα είναι απαραίτητα, χωρίς υπερβολές. Πολύ καλή σχέση απόδοσης - τιμής, δεδομένου ότι στην Άνδρο και ειδικότερα σε αυτό το σημείο, οι τιμές είναι υψηλές το καλοκαίρι. Πολύ καθαρή πισίνα αλλά έχει ταμπέλα ότι δεν επιτρέπονται οι βουτιές (πιθανό προβλημα αν εχεις παιδιά, τέλειο αν δεν έχεις!) Η κα Σοφία είναι πολύ χαμογελαστή και ευγενική και προσφέρθηκε να μας αφήσει late checkout αν και τελικά δεν μας χρειάστηκε. Η πολύ ομορφη παραλία είναι 5 λεπτά με τα πόδια, ενώ είναι πολύ κοντά στο λιμάνι του Γαυρίου (5 λεπτά με το αμάξι). Το Μπατσί είναι 10 λεπτά με το αμάξι και είναι πολύ όμορφο να το επισκευθείς. המקום מעוצב בחמימות רבה, אסתטי מאוד. המארחים מקסימים וכך הצוות כולו. נכונים לכל בקשה ושאלה. נתנו לנו המלצות נפלאות למסעדות וחופים. המקום שקט ושוכן בין הרים. נוף מרגיע מאוד. אווירה כפרית. פרגולה עם אשכולות ענבים יפייפיים - בהם ובתאנים כובדו האורחים במשך היום. ארוחת בוקר חביבה. 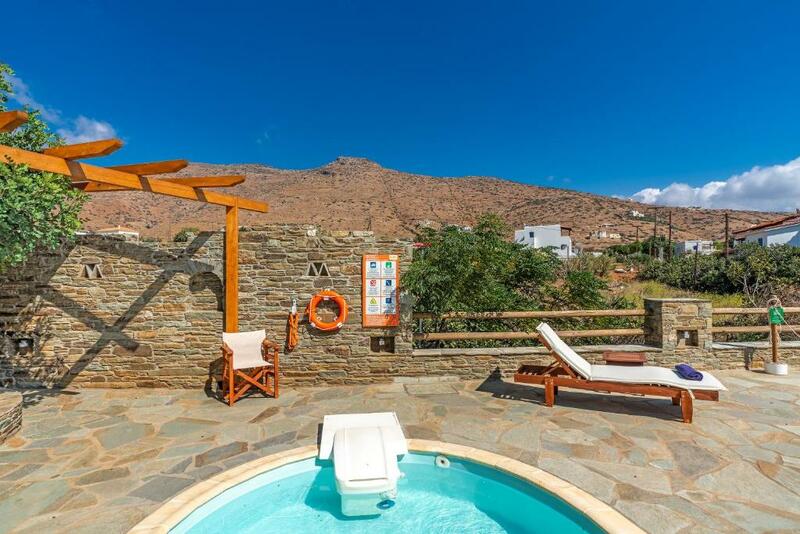 Lock in a great price for Villa Sofia – rated 8.7 by recent guests! 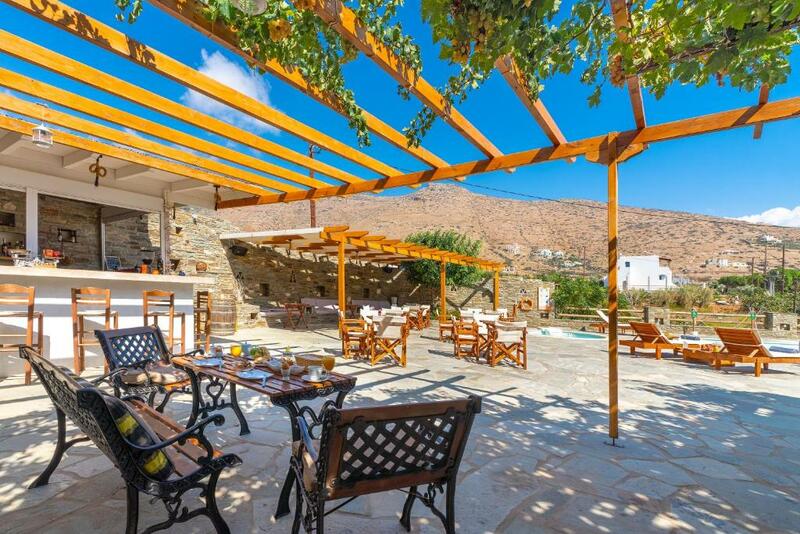 Set amid a 6,000-m2 garden, Villa Sofia is located 800 feet from Agios Petros Beach in Andros. It offers self-catered accommodations, a mini football court and playground. Free Wi-Fi is available in all areas. Divided in 2 levels, each air-conditioned studio opens to a furnished balcony with views to the lush garden. All feature a kitchenette with a fridge and kettle, and a seating area with TV. The private bathroom is fitted with a cabin shower and hairdryer. Guests can also use a shared fax or the computer upon request at the reception area. Buffet breakfast is offered in the outdoor area covered by a pergola including finger food and local delicacies. 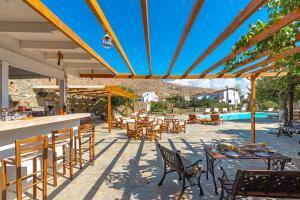 Guests can find a bakery, mini market and tavern within 1,650 feet from Villa Sofia. The property lies 0.9 mi from Gavrio Port and around 19 mi from Chora, the main town of Andros. Free parking is possible on site. Divided in 2 levels, this air-conditioned studio opens to a furnished balcony with views to the lush garden. It features a kitchenette with a fridge and kettle, and a seating area with TV. The private bathroom is fitted with a cabin shower and hairdryer. Free WiFi is also available. 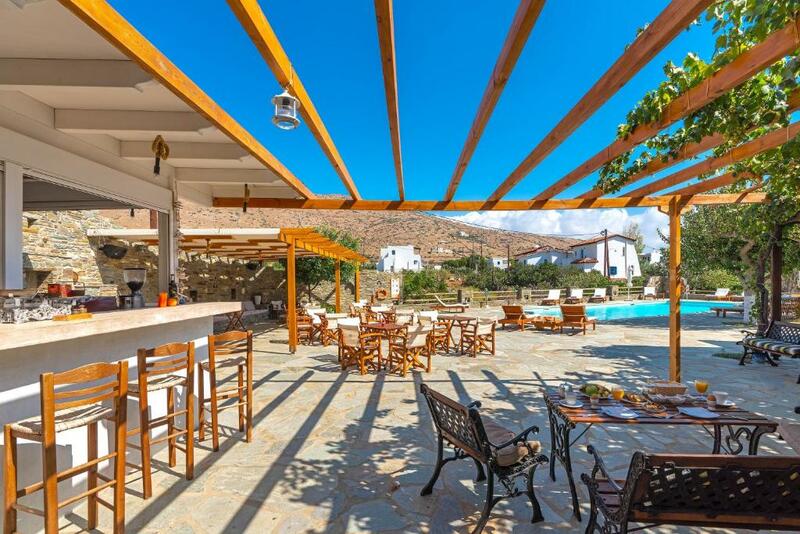 A family run and family oriented-friendly property,with two swimming pools and lush gardens filled with fruit trees(mulberry,fig,apricot,orange,lemon and eating grapes,all for our guests free picking.We offer breakfast with local products on request. Please note that guests can use a shared fax or the computer upon request at the reception area. Please inform Villa Sofia of your expected arrival time in advance. You can use the Special Requests box when booking, or contact the property directly using the contact details in your confirmation. The standard of bathroom and the kitchen didn't meet our expectations. The fridge and the oven had at least 30 years, there was no dishwasher, and the kitchen appliances were very poor. Once -while cleaning the room our suitcases were reorganized (they've been put in different places and all the stuff inside were mixed up - upon our request it didn't happen again). nothing. it was an absolute pleasure to stay at villa sofia. More options at breakfast would be a possible upgrade.